Promotes Drive Right, Drive Safe culture on roads. 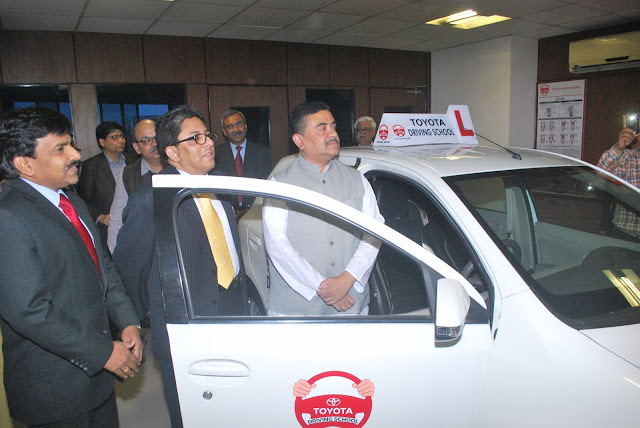 Kolkata, December 30th, 2016 – Toyota Kirloskar Motor (TKM) today announced the launch of the company’s first Toyota Driving School in Eastern India at Kolkata in pursuance of its safety mission of ‘Safest Car with Safest Driver’. Managed by one of Toyota’s leading dealership, Topsel Toyota, this is the company’s first Driving School in East and fifth in India. Present at the occasion were Mr Suvendu Adhikari, Transport Minister, West Bengal, Mr Alapan Bandyopadhyay, Honorable Transport Secretary, Government of West Bengal,Mr Ashok Manaktala, Dealer Principal, Topsel Toyota, Mr Amit Manakatala, Director, Topsel Toyota and Mr N. Raja, Senior Vice President & Director, Toyota Kirloskar Motor. Launched in line with company’s safety mission, Toyota Kirloskar Motor has launched four other driving schools across India in Kochi, Lucknow, Hyderabad, Chennai to improve safety culture in the country. Launched in line with the company’s vision of "Safest car with safest driver”, ‘Toyota Driving School’, one of its kind in the country, will ensure extreme importance on making every student a responsible and safe driver. The curriculum will be a comprehensive driver training program that will boast of high quality and practical and futuristic training models like the driver simulator mechanism which is expected to deliver the “Etios Experience”. To make this experience as realistic as possible, Toyota has incorporated features like IP, steering, and seats of an actual Etios car. 1.Traffic management, rules and discipline. Commenting on Toyota’s role in managing the Driving School Mr. Ashok Manaktala, Dealer Principal, Topsel Toyota Kolkata said “It is a pleasure for us to partner with Toyota in contributing towards improving road safety and traffic in Kolkata. With the growing population in the city, traffic safety has become a crucial concern in the city. Careless driving, over speeding, not adhering to traffic rules has increased the vulnerability to road traffic accidents leading to fatalities and injuries. We are confident that Toyota Driving School with Toyota’s world-class know-how, professional trainers and a comprehensive curriculum, will be able to inculcate a safer and cautious driving behavior amongst the people in our city”. 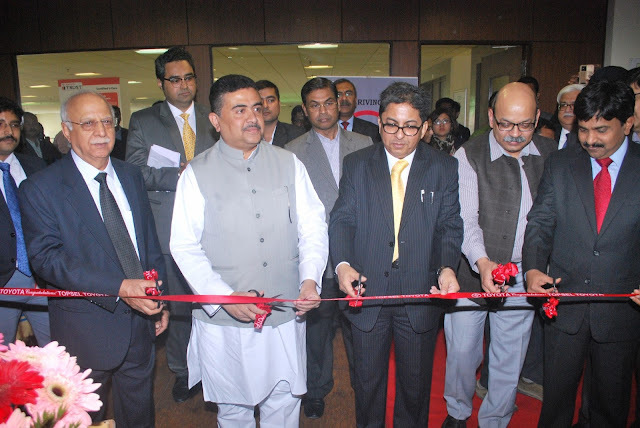 On this occasion we would like to extend our sincere gratitude to honorable Transport Minister Mr Suvendu Adhikari for being part of this launch and extending his kind support for this initiative”. He further added. Speaking at the occasion Mr. N Raja, Director and Senior Vice President, Marketing and sales, Toyota Kirloskar Motor said “We are delighted to launch our first driving school in East India at Kolkata. According to statistics of Ministry of Road Transport and Highways, West Bengal is among 13 states in the country recording maximum number of road mishaps. As Safety leaders in the industry it is our primary mission to ensure safest cars with safest drivers in the country and significantly reduce the traffic accidents with our safety initiatives. We believe the launch of Toyota Driving School is an opportunity for us to come closer to you with a solution to road safety concerns of the city. It is not “just another driving school” for getting a driving license but it’s much more of a place that follows a comprehensive approach ensuring that every single student becomes a responsible driver on road and a safety ambassador. Toyota intends to further reiterate these values and inculcate traffic discipline and road safety among citizens. Toyota has developed computer-based virtual human models, known as THUMS, to analyze and simulate situations that are closer to the actual accident. THUMS is a millennial crash test dummy. Designed as an experimental virtual model of the human body, THUMS functions with organs, bones, ligaments, tendons, and muscle. It is computer animated with 80,000 cyber parts, including a heart - to pinpoint precisely which parts of the body are affected, and how, by various high-impact accidents.